While hubby's away, Ruth will play. And play I did. I decided for dinner tonight to make a dish that he wouldn't have in a million years. 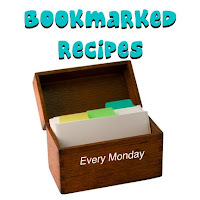 It's a recipe for my Bookmarked Recipes event from Easy Food Magazine (yes I'm back to sharing recipes from it). This actually came at a good time because I had some chicken and kidney beans to use up. I thought the recipe sounded like it was going to taste a little bland so I added some balsamic vinegar, a pinch of cumin, ground coriander and garlic powder to add a little extra to it, however upon tasting I'm sure it would still be delicious without my additions. The original recipe was for 6 but I obviously had to change that to 1 serving for myself, so the recipe below is for 1 serving. 1/3 cup / 80ml kidney beans, drained and rinsed. 2. Season chicken breast with salt, pepper and pour on the balsamic vinegar. Heat a little olive oil in a pan then brown the chicken on each side. Remove to an oven dish. 3. Fry the onion until soft, add the tomato puree, chopped tomatoes, sugar, garlic powder, coriander and cumin and leave to simmer for a couple of minutes. 5. Cook in the oven for 30 minutes and serve. Yum! I love spiced kidney beans! Looks delicious, i love kidney beans , i like their texture. MM..kidney beans and chicken. sound like a real winner Ruth! I do the same thing when Grumpy's away! However, I have made Mexican food (which for some odd reason he does not like!) recently when he was home. Not too well received, but since he wanted to eat, he kept the complaining to a minimum! Mmm... I think it looks delicious! Kidney beans are so wonderfully toothsome! Hi Priscilla, thank you! And thanks for filling me in on your cake. Hi Honeyb. you have to take advantage of these situations don't you? Ruth your recipe saved my dinner tonight. I had beans and chicken and they weren't going to be enough for my folks and brothers and my head wasn't brainstorming yet. I made a few twists though, instead of coriander powder I put fresh leaves at the end, and i also used fresh garlic (I'm obsessed) and whole cumin seeds. They are licking they're fingers!! Thank you for the cool recipe...keep it up! Hey Taabu! Glad you liked it, and glad to be of service!